This Hanukkah: Hoopla or Holiness? In the political and cultural climate fostered under the “sinful offshoot” Antiochus Ephiphanes [the Greco-Syrian king who occupied Israel], the Jewish people began to test the waters of personal liberty as they explored alternative lifestyles outside of godly boundaries. A vocal, activist, minority within Israel—those who were overtly and shamelessly defiling the Torah—paraded their transgressions before the general population, inciting them also to go astray. As the story unfolds, we come to find out that such exploration of “personal liberty” and “alternative lifestyles” eventually leads to dire consequences for Israel. I can’t help but feel like Israel’s history is once again warning us about our potential (and some would say, likely) future. These changes did not happen overnight for Israel, but came on gradually, eventually climaxing in major upheaval. Though all the signs were there, it nevertheless took the nation as a whole by surprise. Will we, too, be taken unaware in the coming days? So, as the Chanukah season approaches, my mind has been drifting toward these things. Though such thoughts serve to strengthen my resolve for righteousness and increase my faith in Adonai’s provision and protection, I nevertheless feel that we as disciples of Messiah need to prepare ourselves to face such days. Understand that what I am talking about here goes way beyond things like political activism. I’m talking about that inner conviction that, when literally faced with pain or death, will cause us to stand unwaveringly for Yeshua. We must refuse to compromise the righteous standards of Scripture today, and thereby be prepared to withstand attacks on our way of life, our families, and even our own bodies. Like Paul, we need to be filled with the fortitude to say that we will serve and stand for Yeshua, “whether by life, or by death” (Phil.1:20). Do you have such conviction? https://www.perfectword.org/wp-content/uploads/2017/04/logo-full-size.png 0 0 Kevin Geoffrey https://www.perfectword.org/wp-content/uploads/2017/04/logo-full-size.png Kevin Geoffrey2012-11-28 00:01:552017-07-06 15:13:31This Hanukkah: Hoopla or Holiness? This conviction and ability to stand firm in the face of whatever, can only be possible if Yeshua is still our/my first love. I sense as you do, things are not as they appear.The conditions are ripe, for a repeat of history.May we all find out whose we are, so we can put our whole trust in Him, who is our, Messiah.There is no hope in any other, than Yeshua. 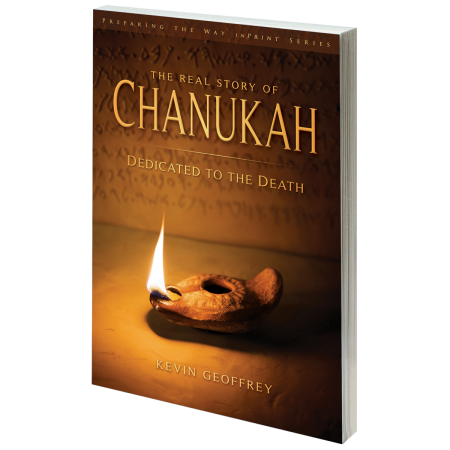 I recently purchased this book and as I’ve been reading it my thoughts have turned to our current state of societies and it has increased my prayer for unsaved loved ones, saved loved ones who still celebrate all but the biblical holidays and for Israel. It has also caused me to examine my own walk with Messiah Yeshua. Todah robah! Thank you for this post . How true your words are we must decide now whom we will serve and prepare ourselves for the battle that is just over the horizon. You are absolutely right. In the times that we are living in, there will come a time where the faithful are going to have to make a stand for Yeshua. We need to build ourselves up in the word now, so when that time comes, we can stand firm, without fear, for Yeshua.